There has been a spike in the recent rate of consumption of single-serve beverages. The growth in their demand is currently the leading factor driving the market for caps and closures for non-carbonated beverages in the U.S. The demand for these caps and closures is also specifically on the rise due to a growing aversion to carbonated beverages amid the growing obesity crisis. 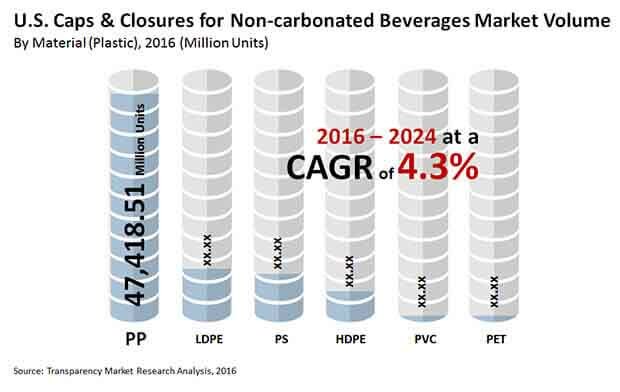 The increasing number of consumers demanding smaller bottles and convenience packaging is also driving the U.S. caps and closures market for non-carbonated beverages. The market is also being spurred by the increasing favorability of seasonal beverages. However, the U.S. caps and closures market for non-carbonated beverages is currently being restricted by the high costs of replacing manufacturing equipment and the switching costs associated with changing from two piece to one piece caps. Conventional manufacturers are also facing a solid competition from closure-less packaging. The U.S. caps and closures market for non-carbonated beverages is also being restricted by the stringent regulations by FDA and the high number of cases against companies regarding sealing breaches. The U.S. caps and closures for noncarbonated beverages market was valued at around US$2.64 bn in 2016, registering a CAGR of 4.3% over 2016 to 2024. By the end of 2024, this revenue is expected to reach US$3.82 bn. Among material types used in the manufacture of caps and closures for non-carbonated beverages in the U.S., polypropylene accounted for leading market share of 60.2% in 2016 and is expected to retain its lead as well as gain a maximum incremental opportunity in terms of market revenue over the coming years. However, HDPE is anticipated to witness the leading CAGR of 13% over the forecast period from 2016 to 2024, due to the cost advantages of HDPE over others as well as its easier availability, and the increasing adoption of HDPE one piece injection-molded closures. The U.S. caps and closures market for non-carbonated beverages is segmented on the basis of cap types, into screw caps, snap on caps, and push on caps. On the basis of material, the market is segmented into polypropylene, low density polyethylene, high density polyethylene, polyvinyl chloride and polyethylene terephthalate. On the basis of application, the U.S. caps and closures market for non-carbonated beverages is segmented into bottled water, fruit beverages, ready-to-drink milk, sports beverages, and others. The bottled water segment is estimated to account for the leading share in the U.S. caps and closures market for non-carbonated beverages in 2016, and is anticipated to expand at a CAGR of 6.1% over the given forecast period. Bottled water is expected to witness maximum increase in basis points during the forecast period, expectedly accounting for 69.3% of the U.S. caps and closures market for non-carbonated beverages by 2024. The ready to drink segment was calculated to account for 8.4% in 2016 and is expected to expand at a CAGR of 9.8% from 2016 to 2024. Key players in the U.S. caps and closure market for non-carbonated beverages so far have included Closure Systems International, Inc., Silgan Plastic Closure Solutions, Bericap GmbH and Co KG, Global Closure Systems, AptarGroup, Inc., Berry Plastics Group, Inc., Amcor Limited, O.Berk Company, LLC, Blackhawk Molding Co. Inc., and Tecnocap S.p.A. The increased aversion to carbonated drinks owing to their high sugar content and their potential role in causing obesity and the number of diseases associated with it has led to a vast rise in demand for non-carbonated beverages in the U.S. in the past few years. This trend has stirred a wave of development in the market for caps and closures for non-carbonated beverage packages. The market for these specialized variety of caps and closures is expected to expand at a healthy pace in the next few years. In this report, Transparency Market Research presents a detailed overview of the present state of development of the U.S. market for caps and closures for non-carbonates beverages. The report also includes vast forward-looking statements suggesting the course of development the market and its key segments will take over the period between 2016 and 2024. The report provides historic market data for 2015 and forecast from 2016 to 2024 based on revenue (US$ mn/bn) and volume (mn/bn units). A detailed analysis of drivers, restraints, and key trends, expected to influence the future growth prospects of the market are also analyzed. The report examines the U.S. market for caps and closures for non-carbonated beverages on the basis of criteria such as cap type, material, and application. On the basis of cap type, the market has been segmented into screw caps, push on caps, and snap on caps. On the basis of the material used to manufacture caps and closures for beverage packages, the U.S. market has been examined for low density polyethylene (LDPE), polypropylene (PE), polyethylene terephthalate (PET), high density polyethylene (HDPE), and polyvinyl chloride (PVC). Of these, the segment of polypropylene presently dominates, accounting for a massive 60% of the overall market and is expected to remain the most preferred material in the next few years as well. The segment of HDPE is expected to witness immense rise in demand over the report’s forecast period, owing to factors such as the easier availability and cost effective nature over other popular materials. The material will also benefit from the increased adoption of injection-molded closures made from HDPE. The key areas of application of caps and closures for non-carbonated beverages include sports beverages, bottled water, ready-to-drink milk, and fruit beverages. Of these, the segment of bottled water is expected to lead to the most prominent share of revenue to the U.S. market. The segment is expected to account for a massive 69% of the overall market by 2024, registering an excellent 6.1% CAGR from 2016 through 2024. The ready-to-drink milk segment will also witness a promising incremental opportunity over the said period, exhibiting an 8.4% CAGR. The report also presents a comprehensive overview of the competitive scenario o fthe market and includes business profiles of some of the leading participants operating in the U.S. as well as the global market for caps and closures for non-carbonated beverages. The intensely competitive market features the presence of regional as well as international companies. The market features a largely consolidated competitive landscape, with the five leading companies accounting for a nearly 55% of the overall market. Key players in the market profiled in the report are Silgan Plastic Closure Solutions, Berry Plastics Group, Inc., Amcor Limited, Blackhawk Molding Co. Inc., Bericap GmbH and Co KG, Closure Systems International, Inc., Tecnocap S.p.A, Global Closure Systems, O.Berk Company, LLC, and AptarGroup, Inc.